Smart Homes and More has the areas most innovative options. We offer the finest, simple to use products, and the most experienced staff in custom electronics and installation. 5x Best of Houzz & 2109 Service Award | We know our industry and we love what we do. We are committed to your satisfaction and determined to ensure that you enjoy each step of your experience with us. AVITtek is Florida’s full-service residential and commercial custom electronics and design integration company. Our primary goal is to make your home or business systems, safe, elegant, fun and easy to use. Our team is comprised of world-class experts in every field whose number one priority is to provide the best products and services to our clients. Exceeding our customer’s expectations is our #1 priority! We are a full-service residential and commercial electronics design and integration company. Our smart home technology solutions make your home safe, current, elegant, fun and easy to use. We are a full service Home Theater Design company specializing in creating Decorative Acoustic Panels. We introduced the concept using artistic prints on acoustic panels. The panels can feature original art, classic art, movie posters and high resolution images. When you decide to work with 3-D Squared, you will feel confident your questions and concerns will always be addressed in a timely fashion. As witnessed in so many of our 5 star reviews, we consistently deliver a quality product and professional customer service in a timely fashion. From System Design to Installation, and Programming we Deliver the Expectation and Service that Sustains Long Term Relationships with our Clients and Produces Referrals for Future Business. We understand the Client wants the System to be Easy to use. Our Experienced Staff is with the Client from the Beginning to the end to make sure all Expectations of the Job are Completed. IT'S YOUR VISION - DONE RIGHT THE FIRST TIME! AV Sound Solutions is your number one integrator in south Florida for new construction or remodeling projects for all of your RESIDENTIAL, COMMERCIAL AND MARINE Audio, Visual and Security projects. We'll understand your vision thoroughly, design and implement that vision then teach you to control your vision...from your fingertips! Our professional designers, certified programmers/engineers and experienced installation teams will integrate every aspect of your Home Theater, Home Automation and Home Security systems. We are formally certified to sell, warranty, train and service the products you’ll need to realize your dream project. ONE STOP SHOPPING WITH CONFIDENCE! RELY ON OUR REPUTATION FOR GREAT COMMUNICATION WITH OUR CLIENTS, BEING ON TIME, ON BUDGET AND RESPONSIVE TO ASSURE YOUR 100% SATISFACTION. As an Audio/Visual enthusiast I learned very early on that home entertainment is much more than high quality audio and video components. Through years of perfecting my craft any home theater or media room requires planning. Each room in your home, office or business space has unique acoustic characteristics that Media Sound Design can determine for you. Media Design Specialists was established in 2000. Over the past 40 years we've grown with the industry, understanding not only the technology but more importantly the people and families that will be using them. This has always given us a clear advantage in ultimately making people happy. A commitment to training and continuing education on this medium has been the backbone to a reputation for quality craftsmanship. -Our systems are easily understandable. -Usually people are fluid in their use in 10 minutes. -Our systems are infinitely scale-able so we can start with the basics and add on. This makes it easy to adapt future technologies to your lifestyle and have one company take care of all your home automation needs! Ultimately I assemble systems that work, and make technology simple! 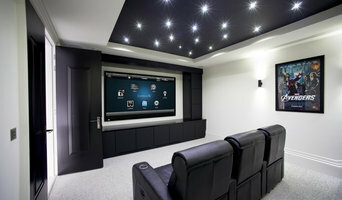 Premium Digital Control & Automation is the premiere Home Automation design and installation company in South Florida. Our award winning system lets you create a home or business that is fully customized and unique in its design. With complimentary consultations and your satisfaction guaranteed, Premium Digital Control & Automation works with you as a partner, rather than a client. We make it easy for your automation system to become an extension and representation of yourself. Our solutions range from universal remote controls and turnkey lighting solutions to complete automation systems. Our team of dedicated and experienced professionals have created one of a kind designs that increase the value of homes and set businesses apart from their competition. Premium Digital is also a leading Hunter Douglas dealer. Windows are the key design element and one of the focal points of any residence. More importantly, though, is the role they play in keeping your home efficient and beautiful. The key to both of these is accurate control of the amount of sunlight that penetrates each room. Motorized shading and drapery instantly transforms the sun’s harsh, damaging glare into soft warm light, protecting your floors, art and furniture from UV rays. Additionally, a customized shade solution enhances privacy, reduces solar heat gain and provides a more restful sleeping environment, all while preserving your home’s exterior views. We have hundreds of window treatments, fabrics and color options to choose from, guaranteed to compliment any décor. With over 3 decades of experience in exceeding our customers' expectations, Premium Digital Control & Automation has the expertise to quickly and seamlessly create a unique environment by integrating technology into your everyday life while delivering superior concierge level service. Boca Theater and Automation is the premier provider of turn-key, custom built integration systems and home theaters in South Florida. We differentiate ourselves by creating a simple to use system that uncomplicates your life. Founded in 2001, by Jeff Galea, BTA is focused on delivering fully automated smart home technology to residential and commercial property. Our systems integrate entertainment, lighting, climate, communication, and life safety controls into your home or office environment. We employ a forward-thinking approach to help insure your investment will fulfill your needs and desires into the future and increase your home’s value. HT-INSTALL has over sixteen years of experience, installing home entertainment electronics for our clients. We feel that personalized first class customer service, attention to detail, and quality are the most important factors to installing a great system. We treat your home as if it is our own, and want the finished product to be easy to use. Call (561) 305-8141 today to schedule your Installation, Consultation or Upgrade done by our one of the kind specialists..
ioty, is a full service design/build home automation and audio/video company serving the South Florida area. We specialize in providing the best service and designs for our clients. ioty's designs are an expression of their client's taste and lifestyle. We will work with you and your team to bring to life the perfect technology interaction throughout your entire home. From beginning to end, our team will work with you, your designers and contractors to ensure your vision is brought to life. At ioty, our core belief is that providing impeccable service during and after a project is the most important part of what we do. Our team is highly trained to always make sure you are taken care of no matter what time or day it is. Give us a call at (305) 363-6354 or click the "Contact Me" button to send us a message and learn how we can help make your dreams become a reality. Our consultations are always free and we look forward to talking about the latest technology and capabilities! Audio One, Inc. has the ability to control its lighting, music, video, motorized shades and temperature throughout all rooms from a single touch panel. It can keep safe with security settings, lighting and cameras accessible from any web browser. We can be told what to do with the touch of a button from any room at any anytime. It can queue up any film in its collection and set the mood with a soft track and preset lighting controls. Audio One, Inc. has touch panels displaying temperature settings and lighting usage that can be controlled to conserve energy and maintain comfort at anytime. We keeps us safe with cameras that can view any room in the home and surrounding areas. You can watch your kids play, monitor your baby sleeping or check on who's knocking at the door all from one display screen. Even when not at home, all rooms can be displayed and controlled from any internet connection. We can do anything the human imagination can dream up. If you're the kind of person who loves hosting parties where guests watch the Oscars, the Super Bowl, or the latest sitcom, putting the time and effort into creating a cozy media room or theater in your Fort Lauderdale, FL home could be a good investment. But unless you're a wiring and surround-sound guru, figuring out the technical issues can get a little messy. That's where a home media designer comes in. Find a home media designer on Houzz. 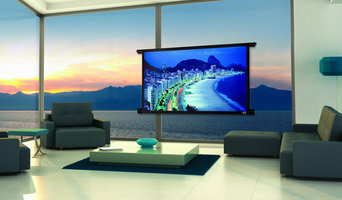 Narrow your search in the Professionals section of the website to Fort Lauderdale, FL home media designers. You can also look through Fort Lauderdale, FL photos by style to find a room you like, then contact the professional who designed it.